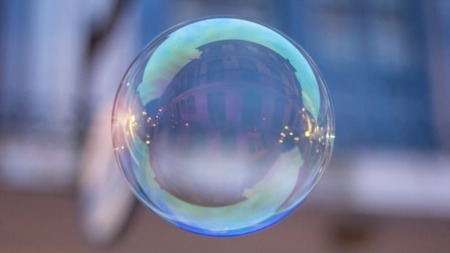 Unless you’re a real estate agent, you may not have heard of the MLS (pertaining to real estate, not soccer), much less know what it stands for. 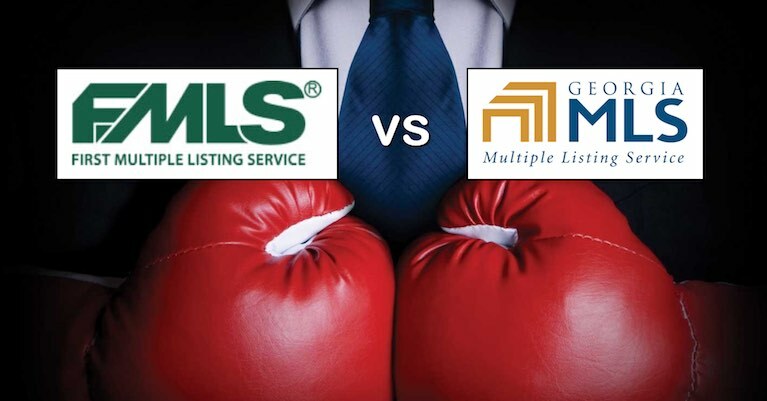 Even if you do, you probably don't know there are two different Multiple Listing Services (MLS) serving Metro Atlanta; FMLS and GAMLS. However, if you’re in the market to purchase or sell real estate, it’s worth learning just a little bit about them to become a more educated home buyer or seller. For consumers, understanding the characteristics of each MLS can help you determine the website(s) you should use to search properties, and may even play a role in which REALTOR® you decide to hire. In this article, I’m going to cover some differences & similarities between the two MLS providers and discuss what consumers may want to consider when searching homes for sale online. CLICK HERE to search FMLS & GAMLS listings all on one site. As a consumer, the majority of your personal interaction with data from either listing service will likely be through a third party home search portal (unless you’re searching homes on GeorgiaMLS.com or their app). Therefore, your experience will largely depend on the design, features and setup of the individual website or app you're using. For this reason, it’s a good idea not to write off one MLS provider or the other based on your experience with only one website. Keep in mind, both MLSs have a wide coverage area, so most neighborhoods within Metro Atlanta should have at least one active or pending listing. If you’re searching homes on an agent/broker’s IDX website and not getting any results for a search by location, you may need to try using a different website. Just make sure your search criteria isn't too specific before you do. To compare the two, I’ve come up with a list of factors that have the biggest impact on a homebuyer's search. Each service has its positives and negatives, so it will likely come down to what you’re searching for, how you’re searching for it, and the location in which you are looking. All of the listing counts included in the analysis below are current as of June 8, 2016. The primary factor you need to consider when determining which MLS to use, should be the location in which you’re looking to buy or rent a property. While both MLSs are prevalent throughout Metro Atlanta, generally speaking, FMLS tends to be more popular in the city and the northern suburbs. Many agents consider FMLS the primary MLS for searching properties inside the I-285 loop (ITP), while GAMLS has traditionally been seen as the service of choice for properties located outside the perimeter (OTP). To compare the number of listings available on each service, I ran a search for all property types (residential for sale/lease, land/lots, and commercial for sale/lease) that were currently active or under contract (as of June 2016). When comparing the total number of listings, GAMLS has the most by a long shot. With approximately 71,727 listings to date, GAMLS has about 40% more listings than FMLS does (approximately 51,535). Note: Some sites have the ability to include listings from both MLS providers from a single search. 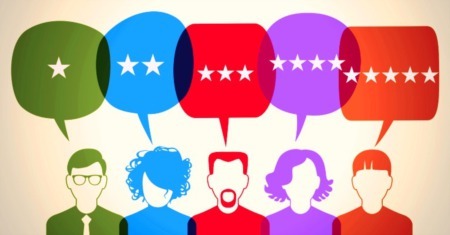 When done correctly, the searcher gets access to all the listings from a single source. This is probably the best way to search because it eliminates the need to duplicate your efforts on multiple sites. Implementing a co-mingled feed into a single search can present challenges, so expect to see duplicate listings of the same property on occasion. You should also check to see if under contract listings are included in a site’s search, or if they only show active listings. A common decision Atlanta buyers often have to make is whether to live inside, or outside, the perimeter. In comparing the number of ITP listings on both MLSs, it’s clear that you’ll primarily want to use a search that includes FMLS listings when looking to buy in the city. As you can see in the breakdown below, a higher percentage of the listings on FMLS are located ITP. Also, despite only having only about 72% of the total listings that GAMLS has, FMLS has over 36% more listings located inside the perimeter. Expanding the search radius out to 25 miles, you’ll notice that about half of all FMLS listings are located within this area. 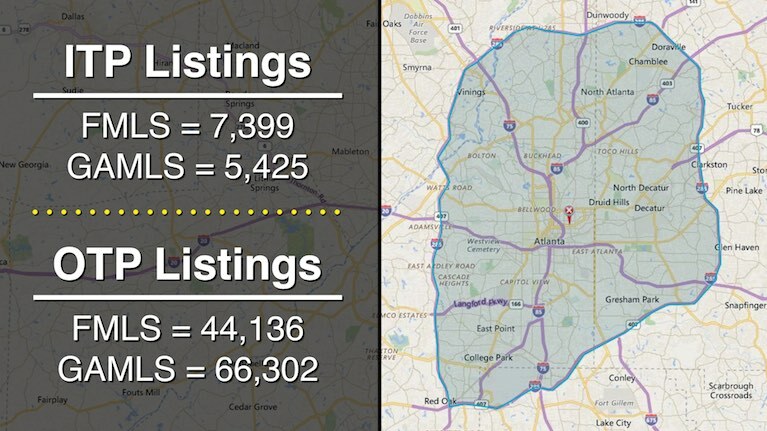 However, GAMLS only has about a third of its listings located within 25 miles of Downtown Atlanta. More importantly, FMLS still has the slight edge with nearly 9% more listings located within this area. 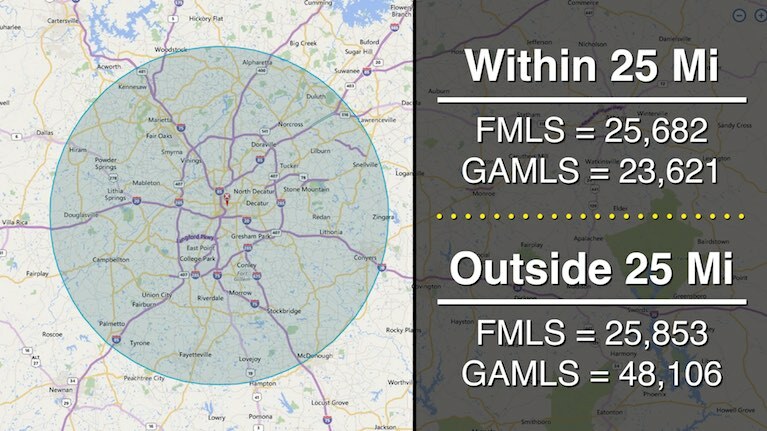 From looking at the numbers, it’s clear that FMLS is the more dominant listing provider if you’re looking for properties near the city, while GAMLS has more coverage outside of Atlanta. Keep in mind, there is a lot of overlap between the two services, but obviously FMLS is more prominent the closer you get to the heart of Atlanta. Out of curiosity, I wanted to compare the number of residential listings available on each MLS under $100K within 25 miles of Downtown Atlanta. Why $100K? Well, I wanted to see if there was a noticeable difference in the prevalence of lower priced residential properties on one MLS or the other. By limiting the search area, I hoped to compare a similar size pool of properties and reduce the impact rural homes could have on the results. The total number of residential listings on GAMLS within 25 miles was 19,809 properties, while FMLS had 21,379. Despite having less total properties listed for sale, GAMLS actually had more under $100K. On GAMLS, there were 3,252 properties in the under $100K price range, while FMLS only had 2,598. This means there were 25.2% more sub $100K properties on GAMLS despite having 7.3% less total properties listed within the area. Note: Because some agents/brokerages may not serve all areas covered by the MLS, the listings displayed on their website may be limited by location or price. Removing listings based on city, zip, county or MLS is typically an easy process. The benefit to both the agent and the consumer is that, it prevents inquiries and showing requests from outside a service region where the agent would need to refer the searcher to another agent anyway for additional assistance. Each MLS allows multiple types of properties to be listed, and some are more prevalent than others. For example, single family residential (homes, townhomes, condos, etc.) for sale currently makes up about 77% of the listings on FMLS, and about 69.5% of the listings on GAMLS. In addition to single family residential properties for sale, you can also find multifamily properties, residential lots, acreage & farmland, residential rentals, commercial properties and commercial rentals. Below, I’ve calculated the percentage of each type of listing compared to the overall number of listings. As you can see, commercial properties only account for a small percentage of the overall listings. This is not because there aren’t many out there, but because most commercial properties are listed by agents who specialize in commercial real estate, therefore, they’re listed on other services such as LoopNet, CoStar and Xceligent that strictly cater to the commercial real estate world. 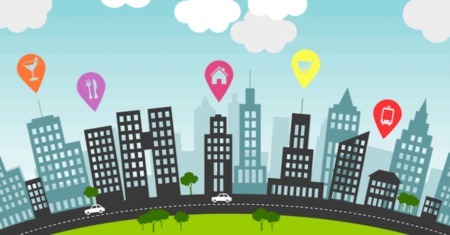 Note: Similar to location, not all agents/brokerages work with all types of properties. For example, we typically don’t do rental or commercial transactions. 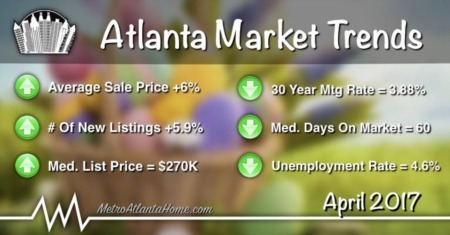 Therefore, you won’t find rental properties or commercial properties using the MetroAtlantaHome.com property search tool. These types of properties have simply been removed from the MLS feed on this site. In addition to a property search, each MLS has dozens of powerful tools agents can use to streamline their efforts and maximize their business. This allows member agents to access tons of data that's usually not available to the general public. Buyers and sellers who want the competitive edge in today’s market should hire an agent that not only has access to these advanced tools, but knows how to leverage their power to benefit clients. From a client contact manager to complete transaction management, mortgage calculators to paperless document management, both MLSs include the latest and greatest real estate technology. Some tools are integrated into the platform, while others are offered by third party vendors (but included with the MLS membership). The plethora of tools available from FMLS is enough to make your head spin. For agents working with buyers, Down Payment Resource and RatePlug are built right into the search results & listing detail pages. Realist, a powerful property database powered by CoreLogic, gives agents easy access to tax records, sale/mortgage history, market trends and more. In addition, sellers and listing agents love the integration with ShowingTime, making showing appointments and follow up a breeze. FMLS has strategically partnered with companies like Listingbook (online client servicing tool), Property Panorama (virtual tours), ShowingTime (schedule showing appointments), Down Payment Resource (search for down payment assistance), CloudCMA (instant home value reports), GeorgiaOpenHouses.com (open house search), and MARKETrends Premium (local real estate market trends) to give agents all the tools needed to run a successful business. With the recent release of Paragon, GAMLS now offers agents one of the most powerful search platforms available today. In addition, the all new Homesnap Pro app has revolutionized real estate search on mobile devices. Now, conducting business on the go, is a snap. Members also get access to industry leading tools such as CloudCMA (instant home value reports), FIND (nationwide real estate search), CRS Data (tax record search, ListHub (listing syndication), and self paced online training courses. Great looking agent/broker websites are also included with a GAMLS membership, something not offered by FMLS. These powerful websites give agents and brokerages a presence on the web along with an integrated property search tool. These sites include a featured listings display, buyer & seller resources, real estate tips and more. For an additional fee, agents can upgrade their site with tons of additional features. 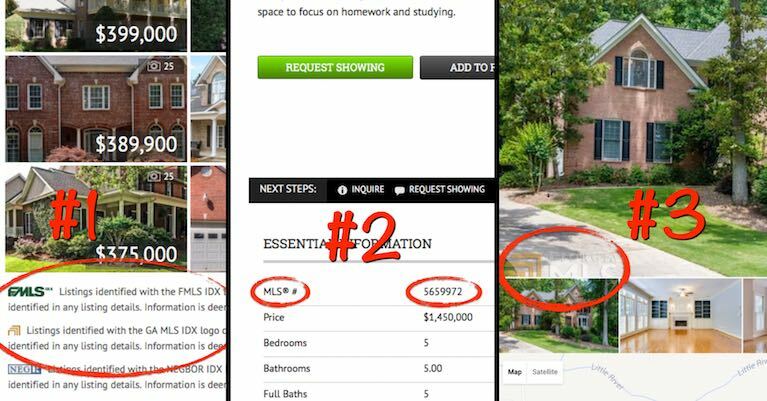 When searching properties on a particular website, you may want to determine which MLS feed the site is using. There are a few easy ways you can quickly identify whether the feed is from FMLS or GAMLS. Look for the required IDX reciprocity disclosure and MLS logo on the page. It is usually located near the listing details or at the bottom of the page. Search for the property’s listing number. The listing number is usually located somewhere on the listing details page, either in the description, the page title, or in the page url. Currently, FMLS listing numbers start with a 5, while GAMLS listings start with a 7. Check for a watermark on the listing photos. By default, GAMLS watermarks all images uploaded to the MLS with their logo, while FMLS has no watermark. Keep in mind, sometimes agents and sellers use photos from previous listings, downloaded from GAMLS directly or a GAMLS feed. This means the current listing may not be from GAMLS, but was, at some point in the past. As an agent, I use both MLS providers to search homes for clients and advertise homes for sale. However, I prefer using FMLS to search properties, and have even set up my website using the FMLS IDX data feed. FMLS seems to have better coverage in my primary service areas, and to me, their search tools are easier to use. I always create saved searches for clients on GAMLS too, but I prefer using FMLS for day to day searches and market research. Want to search properties like a REALTOR®? Register for a free account today!